By default WordPress displays your content in a blog format on the homepage. But what if you want to create a custom homepage in WordPress? Where does your blog page go? In this article, we will show you how to create a separate page for blog posts in WordPress. WordPress comes with built-in support for creating a custom home page (static front page), and a separate page for blog posts. To use this method, you need to create two new WordPress pages. The first page is going to be your custom home page. In your WordPress admin, go to Pages » Add New to create a new page. You can title this page Home. 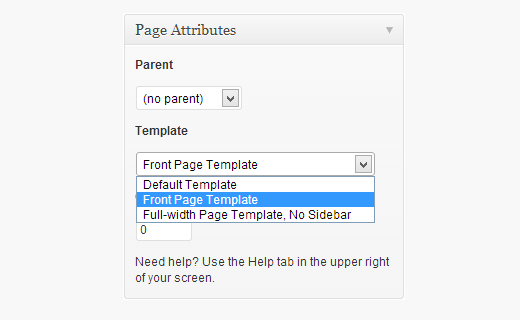 On the right hand side, you will see Page Attributes box with an option to choose a template. Most modern WordPress themes come with custom page templates that can be used for the static front page of your website. In this example we are using the Twenty Twelve theme which comes with a front page template. After choosing the template, the next thing you need to do is to click on screen options at the top right corner of the screen and check the discussion box. This will display discussion meta box below the post edit area. Uncheck both comments and trackbacks to disable discussion on the home page. Save your changes, and load your site to review changes. You may want to display the blog page in your navigation menus. To do that go to Appearance » Menus and add blog page to your menu.